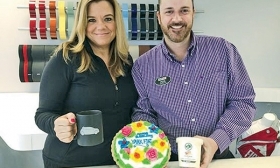 Christine Senack and Peter Cottingham celebrate Yark Fiat's third birthday with cake and gelato. * Cool perk: Co-op farming program. For the past three years, Yark Fiat has partnered with a local clean-organic farm that grows fruits and vegetables without synthetic pesticides or fertilizers. All the seeds used are heirloom seeds and have never been genetically modified. The result? According to the dealership, "absolutely the freshest, tastiest, best-for-you fruits and veggies" delivered weekly for employees' and customers' families. * Vice President Doug Kearns on a change in response to staff requests: "Last year's largest request was [about] the lack of employee parking. Because our dealerships have grown so much and our inventory has also grown, we have lacked adequate space for appropriate employee parking. Our owners took action and rented temporary space off-site for vehicle storage and made another parking lot available for employee parking."